Got a little monster around the house? 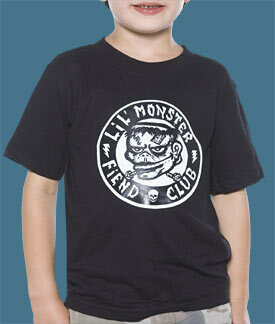 They'll love rockin' out in this awesome black t-shirt featuring a screenprint of a Frankenstein monster head with "Lil' Monster Fiend Club" text! 100% pre-shrunk cotton. This t-shirt comes in size Youth X-Small. The chest measures 28" and the length is 18"